In the Heart of the Rocky Mountains. 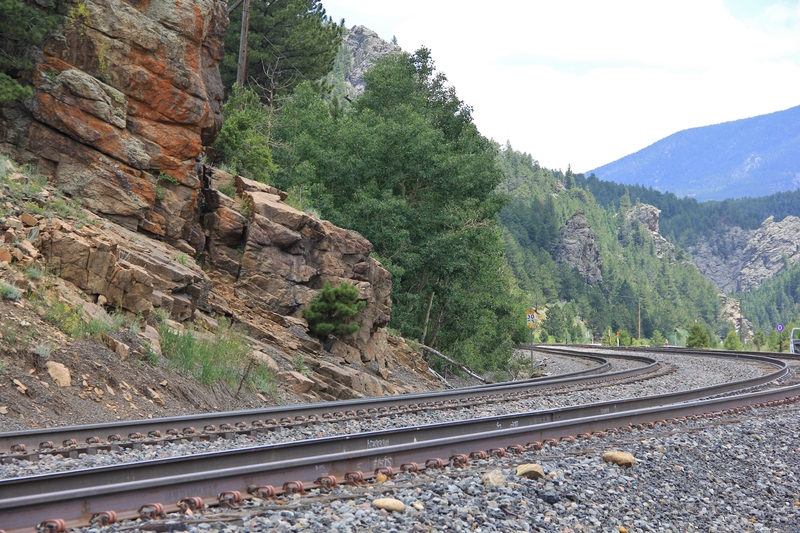 The Main Line has tight curves and a steep steady grade as it hugs the hillside ascending the Front Range. 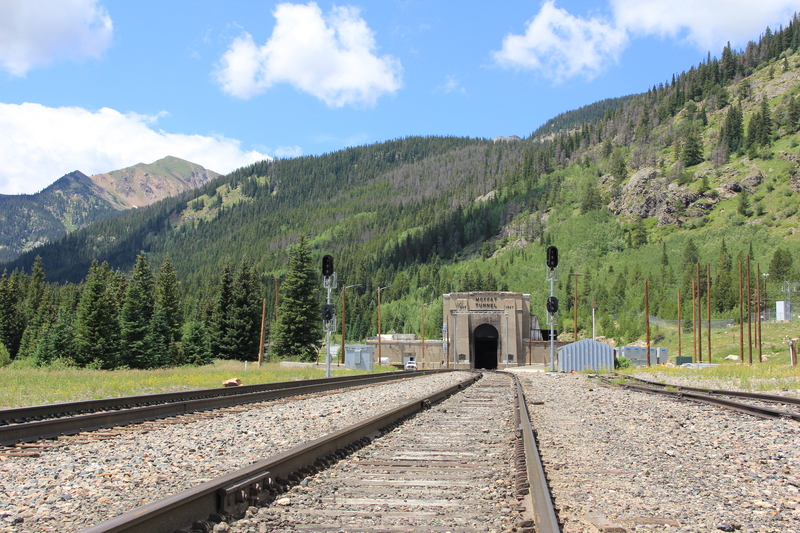 There are 17 tunnels in the first 30 miles the rails climbs from Denver to Pinecliff. In those places where a cliffside is particularly steep or there is just too much rock to remove for a cut, they drill and blast a hole under the mountain. Generally these tunnels aren’t very long and you can see daylight one side to the other. They are narrow though. Only a couple of feet clearance are above and either side of a locomotive. I remember one time there was a terrible accident. There was an area where one side of the track had sunk lower than the other. As the train rolled over the uneven rails it set the cars behind rocking back and forth sideways. This was right at the mouth of one of those tunnels. About a dozen cars had passed swaying over the spot when one car tipped a bit more off center than the others and connected with the solid rock entrance to the tunnel. With six locomotives pulling up front on a downhill grade and fifty cars behind held back by an immovable mountain something had to give. It was one hell of a derailment. I can’t imagine the terrific screeching and bedlam of noise. Two cars were shredded and smashed, four others had flipped over. Inside the tunnel and out rail had been ripped loose, bent and twisted, wooden ties had been torn up and splintered, huge shards of steel had embedded themselves in solid rock. It took 10 or 12 hours to clear the wreckage, replace and tamp new ties and spike in new rail. No going home that day, you gotta do what you gotta do. The Main Line needs to be open what ever the cost, there are schedules to keep. But wait I get ahead of myself. I was a railroad man for the D&RGW. A Gandy Dancer. Sometimes in life you take whatever work comes along. In the late spring of 1977 the country was still climbing out of a slight recession and economic slump. At the time I felt fortunate to get hired for the Denver & Rio Grande Western Railroad at the Pinecliff Station section. I had no idea what I was getting myself into or what to expect, except for the five dollars and eighty four cents an hour and a steady pay check delivered every two weeks. It was an experience I will remember for the rest of my life. A year and a half later, two hundred miles distant and after two transfers (Moffat Tunnel and Steamboat Springs) I had gained enough seniority and experience to earn six dollars and thirty five cents an hour for my labor. The paycheck was still every two weeks. No paid vacation but I did get a free rail pass. I was a Gandy Dancer from the Rio Grande over the Great Rocky Mountains and I had money in my pocket. It was glorious. The development of the American West and development of the the railroads are intertwined and were mutually supportive. The growing towns were better supplied by the railroad and goods could be shipped out and wherever the railroad laid track new towns would spring up. Traveling by horse and wagon from Denver toward Santa Fe a man could travel 20 miles in a good day. A train could cover that distance in an hour. In 1871 Civil War veteran Gen. William J. Palmer founded the Rio Grande Railroad and started building a line from Denver towards Mexico. A railroad war soon erupted and competitor Atchison, Topeka & Santa Fe gained control of the southern route over Raton Pass. The determined Rio Grande turned it’s direction west into the mountains. 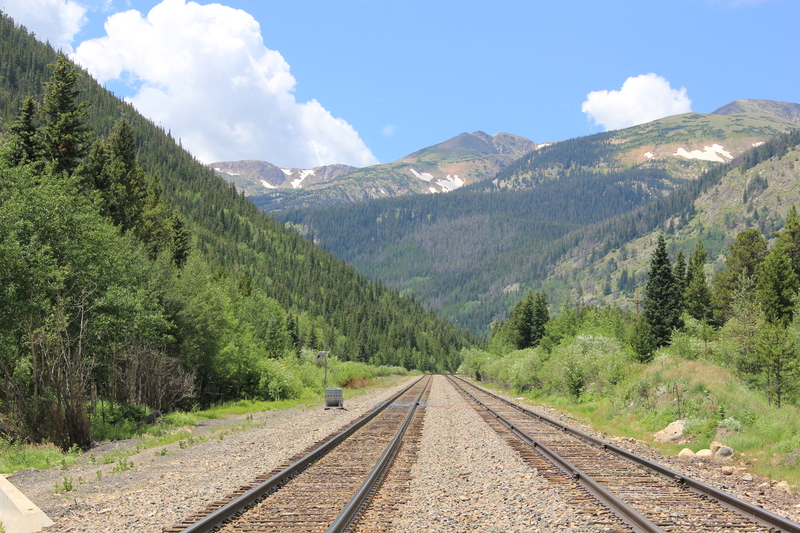 The Rio Grande’s possession of this route allowed access to the booming Leadville gold mining district of Colorado. The Rio Grande soon had a network of lines through the mountains connecting the mining towns and pushed on to Salt Lake City, Utah. 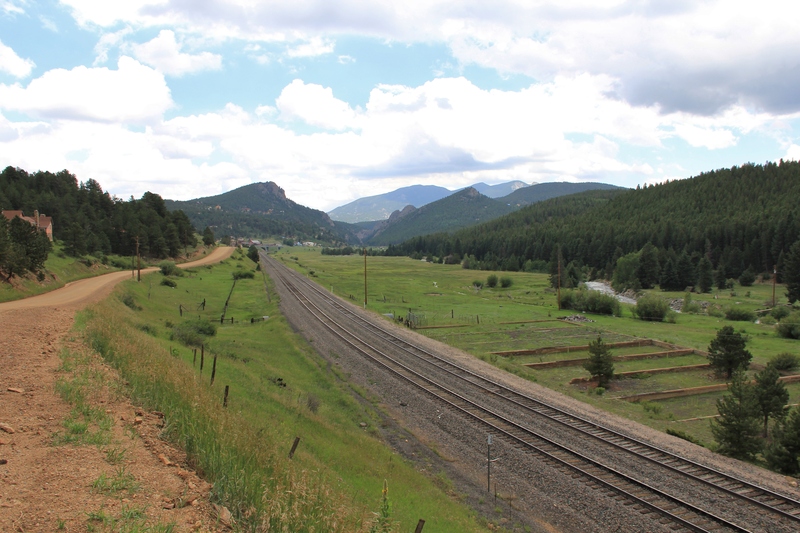 The D&RGW operated the highest mainline rail line in the United States, over the Tennessee Pass at 10,240′ and the famed routes through the Moffat Tunnel and the Royal Gorge. 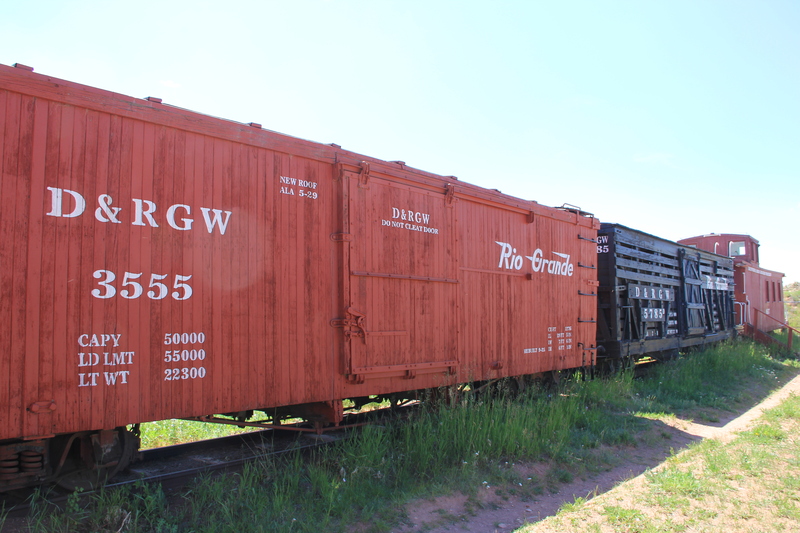 The Rio Grande was the epitome of mountain railroading, with a motto of Through the Rockies, not around them. At its peak mileage in 1917, the Rio Grande was operating nearly 6,000 miles of track across mountains, canyons and plateau. The famous passenger train the California Zephyr rode their rails. It was spectacular scenery. Taking advantage of it’s unique geographical location the Rio Grande offered a “rail cruise”, a journey through the Rockies with gorgeous vistas of mountains and canyons. The Main Line passes through wild uncivilized remote country. That is where I worked, in the remote country. I was part of a section maintenance crew. 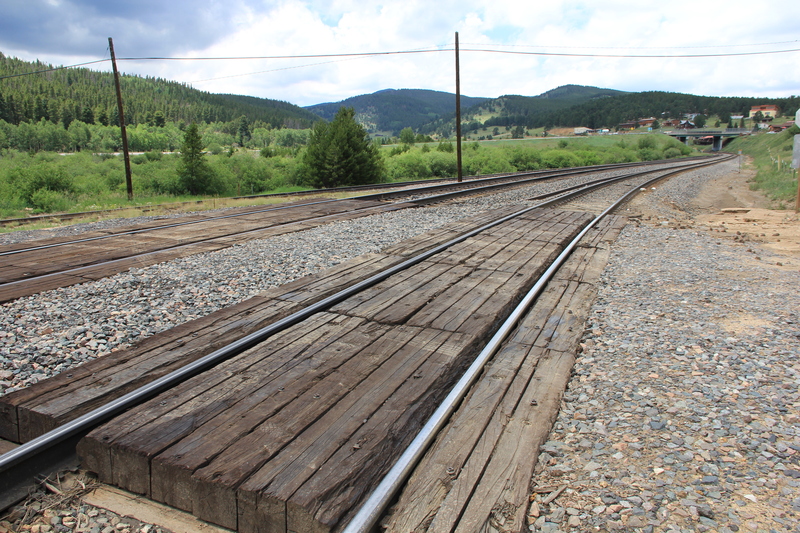 For a 20 mile stretch from our station out we maintained a section of the railroad track over the Rocky mountains. The famous Moffat Tunnel Route was my second post. It was about October when I was transferred and told to now report for work at the Moffat Tunnel, East Portal. Snow and winter winds were already howling in the mountains. I would be mostly working inside the tunnel shielded from the cold…but in the darkness. It all seemed rather exciting. 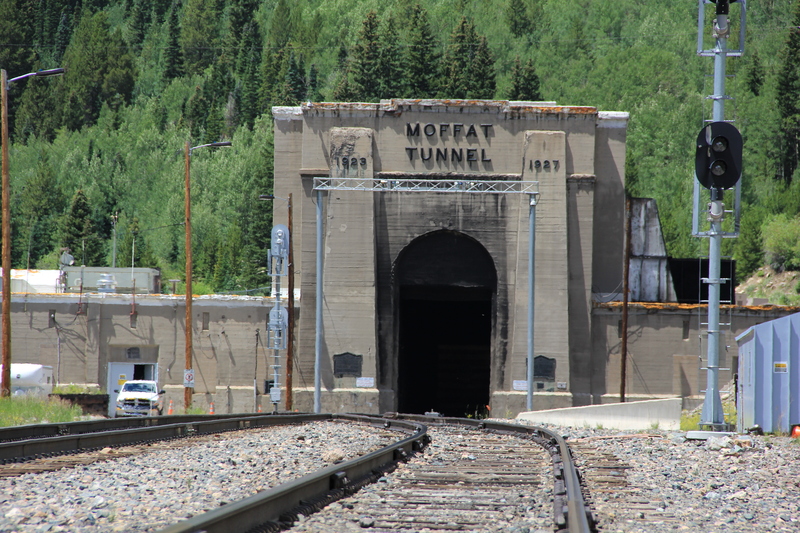 The Moffat Tunnel is 6.2 miles long and is 9,239 feet above sea level as it bores under the Continental Divide. Fifty miles east is Denver, on the other side of the tunnel is Winter Park and the road to Kremmling. Completed in 1927 the tunnel finally gave the Rio Grande efficient rail access to the West Coast. Inside the tunnel it was dim, damp and dangerous work. We were replacing railroad ties and moving rails. Tough brutish men toiling deep inside the mountain like trolls. I didn’t see the sun for days. It was dark as I drove the 10 miles of dirt road from Rollinsville to the portal early every morning. At the end of the shift as we emerged from the tunnel the sun would have already set behind high peaks. Dark going in and dark coming out. Sometimes we would vacate our work and move outside for passing trains during the day. Often it would be into a driving snow storm and ferocious winds. We would stand there freezing in the blinding white-out waiting for the call of all clear to go back into the darkness and throw heavy timbers about and swing hammers against cold steel. A section crew is comprised of 5 men and a foreman. The Foreman does not pick up tools. His job is to insure safety and keep his eye and ear out for an oncoming train. 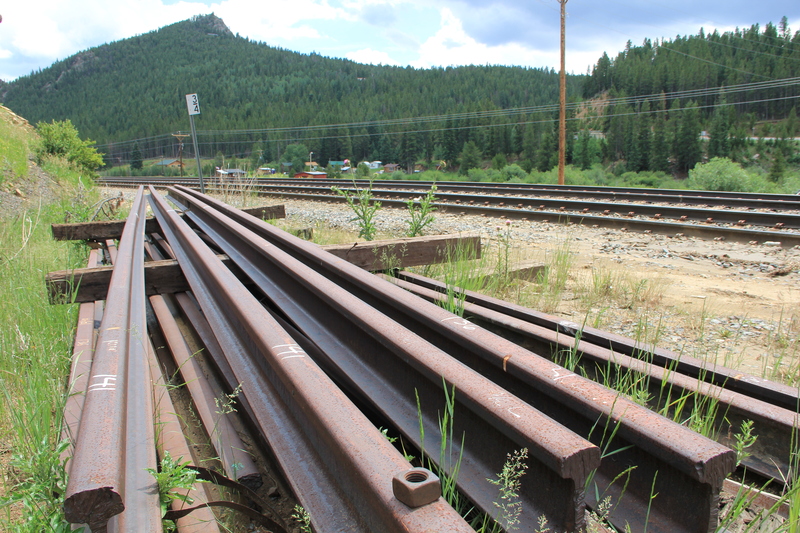 The work of the section crew is to replace rotten ties, worn-out rail and keep the track level, in line and at the standard gauge of 4 feet 8 1/2 inches. Crossings, trestles, switches, and signals all get regular inspections and maintenance. During times of flood or derailment specialized skills are deployed, for other emergencies there are specific guidelines and procedures to follow. The primary three materials the section crew works with are 1. ballast stone (crushed 2″-3″) for the road, 2. wood cross ties (usually oak w/preservative) for the railbed, 3. and standard length of steel rail, mounting plates, couplers and basic connectors. All of this material is solid and significantly heavy. The tools for each man, made all of steel are also solid and substantial. The D&RGW section crews I were with had all the tools we needed for our work but they were basic. The kit would include: A number of 5 ft. long iron bars, one each short handle square edge shovel, one each dbl. sided pick, several 3 lb. short handle sledgehammers, a few 30 lb. ratchet jacks, a couple of massive cold chisels and wrenches and one each 10 lb. long handled spike maul. We had no generators, pnuematics or any kind of power tool when we went out on our regular days. We did everything with hand tools the way it had always been done. 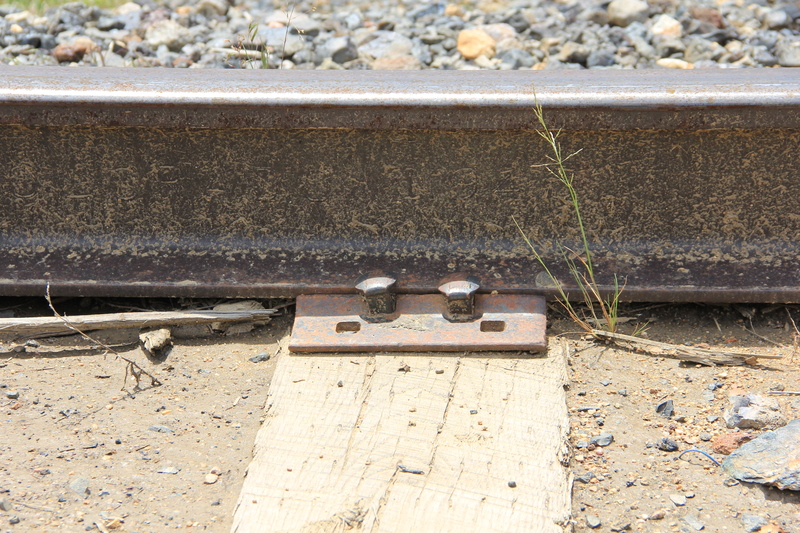 There are 3 to 5 spikes driven through a plate to hold the rail in place at each wooden tie. One person goes ahead and gets the 6″ spike started in the wood giving it a few whacks with a 3 lb. sledge. A few yards behind comes the next man on the line with long handle spike maul swinging and with a few mighty blows drives the spike home with the head sitting snug on the rail flange and moves on to the next tie. The next man in the walking line drives the spikes in on the opposite of the rail. Missing and striking any of the rail is not allowed and the foreman will issue a reprimand if it happens. Sometimes I’d get out ahead, all by myself just swinging like a windmill. I’d get a rhythm going and in 3 powerful strikes drive a spike down, another, another, take a step and a swing, swing, swing, another, another on down the line. For kicks and bets we would set a dime on top of a spike and drive the spike in without the dime falling off. A Gandy Dancer is an old time nick-name for a track worker. The story I heard of the names origin comes from the moves made while packing and tamping ballast under a railroad tie. With two hands on the ‘D’ of a short handle shovel and one foot on the blade a quick repetitive up and down force can be applied to force gravel under a tie and pack it tightly around. The resulting up and down jerky knee movement resembles a kind of dance. The dancing partners for these men were the tools they used, which were produced by a company of the name of Gandy. There are other legends of where the name Gandy Dancer originated but the work that these railroad men do is the same the country over. Barry Dornfeld and Maggie Holtzberg produced an excellent documentary film about Gandy Dancers. They were able to conduct interviews, record work songs and hear what the work was like directly from old time southern railroad men. This 1:51 minute video trailer from the film explains clearly what a Gandy Dancer does. Our foreman did not allow any singing like the men in this film do. We had to be quiet to listen if he might call out an order. Even at a distance the foreman can see each man and if he has a tool in hand. Everything was outside, in the open. Every day outside in every kind of weather. There is no bench or shelter along side the railway to duck into if it begins to rain. There is no shade from the blazing sun on the open railway line. When winter winds blast through the canyons there is naught to do but turn up the collar, tuck in your chin, keep moving, keep working, faster, harder, everyday, out there somewhere on the side of a mountain, following a ribbon of steel. Gandy Dancing on the Denver & Rio Grande Western Railroad was the toughest, hardest job I ever had in my life. It is also one of the most memorable. The personal physical challenges met under extreme conditions and conquered is remarkable to me. The back road less country where only the railroad can go was spectacular to see. It was a unique opportunity to be in the heart of the Rocky Mountains. It’s an honor to say I worked for the best mountain railroading line in the world, the Rio Grande and I can say with pride I appreciate our motto Through the Rockies, not around them. 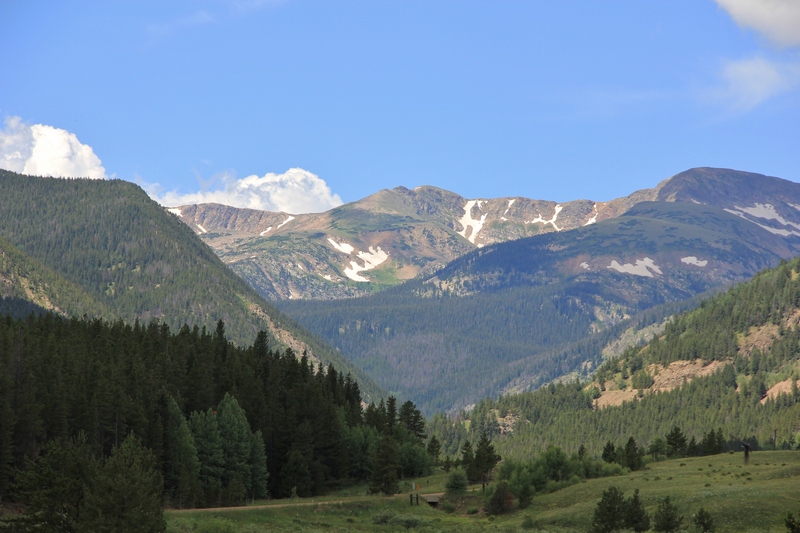 This entry was posted in environment, history, local economy and tagged Colorado, Earth, hiking, history, photography. Bookmark the permalink. Dohn, that was absolutely fantastic. It’s what blogging’s about – passing on information and experiences to the rest of the world, stuff that would otherwise have faded into obscurity. I hope your Gandy Dancing days are well and truly over because it sounds like a hell of a hard way to earn a living. The tunnel was the brainchild of David Moffat of the Denver, Northwestern and Pacific (DNW&P) railroad as early as 1902. The original DNW&P tracks climbed Rollins Pass with a series of switch back loops with a steep 4% grade and severe snow conditions. Snow removal on the original line made it unprofitable to operate. Great post, Dohn. Thank you.